This term is very generic, referring of course to frits that contain boron. Unfortunately that is 80-90% of available frits! Boron frits may have 1% boron or 50% boron. Even though the boron in the frit is no longer in the borax form it is still customary to refer to such as "borax frits". Since many textbooks call for a generic borax frit in certain glaze recipes it can be very difficult to determine what frit to use. However many technicians agree that the common frit formula of Ferro 3134 is what is intended by the generic term 'borax frit'. This frit is not a glaze-by-itself like 3124 or 3195, it is intended to melt at a very low temperature and as a way to add borax without alumina. Raw sources of boron (like Borax) are soluble and thus not suitable in glazes (which are suspensions of particles). There are some raw mineral sources, like Gerstley Borate, Colemanite and Ulexite. 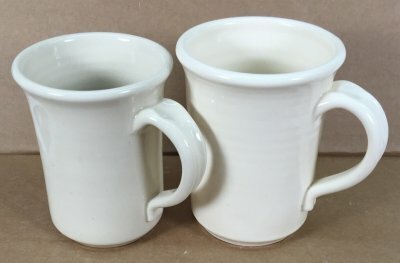 However these materials have various issues that must be tolerated to use them effectively, normally only potters are able to negotiate these. 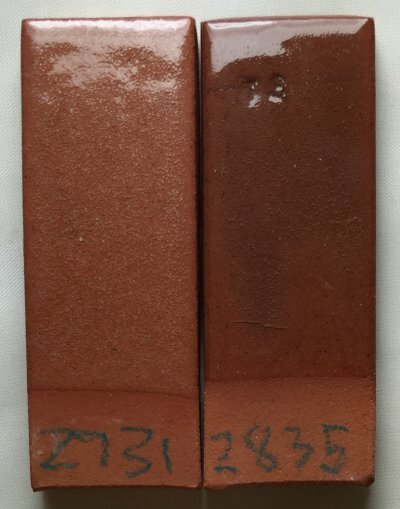 These two specimens are the same terra cotta clay fired at the same temperature (cone 03) in the same kiln. The chemistry of the glazes is similar but the materials that supply that chemistry are different. 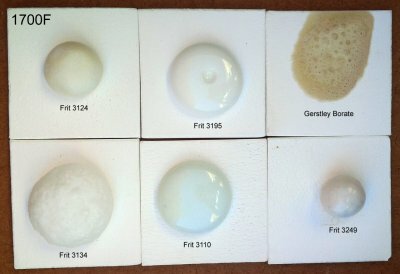 The one on the left mixes 30% frit with five other materials, the one on the right mixes 90%+ frit with one other material. Ulexite is the main source of boron (the melter) in #1, it decomposes during firing expelling 30% of its weight as gases (mostly CO2). These create the bubbles. Each of its six materials has its own melting characteristics. While they interact during melting they do not mix to create a homogeneous glass, it contains phases (discontinuities) that mar the fired surface. In the fritted glaze all the particles soften and melt in unison and produce no gas. Notice that it has also interacted with the body, fluxing and darkening it and forming a better interface. And it has passed (and healed) most of the bubbles from the body.